Despard, Charlotte (1844–1939), suffragist, nationalist, socialist, and writer, was born 15 June 1844 in Ripple Vale, Kent, the third daughter of Captain John Tracey William French RN, a relative of the Frenches of Co. Roscommon, and Margaret French (née Eccles), a wealthy heiress. Educated privately by a series of governesses, and for brief spells at private schools, as an adult she was highly critical of her education, which she considered both ‘inferior’ and ‘slipshod’ (Linklater, 26). Her father, a disciplined and rather distant figure, died when she was nine, and her mother, who had long been unstable, died in an asylum in 1860. Instinctively rebellious as a child (Milton's Satan was an early hero), Charlotte's non-conformity was heightened by a period living with her mother's relatives in Edinburgh. She reacted violently against their presbyterian values, and when her eldest sister came of age she settled with her in York. In 1870 she met and married Maximilian Despard, a member of the Irish protestant gentry from Queen's County (Laois), who had made his fortune trading in Hong Kong; their honeymoon in Ireland was her first visit to the country. His chronic ill health forced them to spend much of their time abroad. Though their marriage was childless it was extremely happy; he shared many of her progressive opinions and encouraged her to write. In the period that followed she produced a string of novels, among them Chaste as ice, pure as snow (1874), The rajah's heir(1890), and A voice from the dim millions (1884), the last of which stands out for its radical tone. Her husband's death in April 1890 left her distraught, but after a period of intense mourning she found a new lease of life in philanthropy. She moved to the slum district of Battersea, London, to live among some of the city's poorest inhabitants; there she established and financed mother and baby clinics and boys' clubs. The desperate poverty she witnessed resulted in her becoming increasingly radical. She joined the Social Democratic Federation and the Independent Labour Party, the latter encouraging her in her successful contest for a place on the Lambeth poor law board in 1894. By 1898 she had converted to catholicism, a faith which she subsequently fused with a growing interest in theosophy. 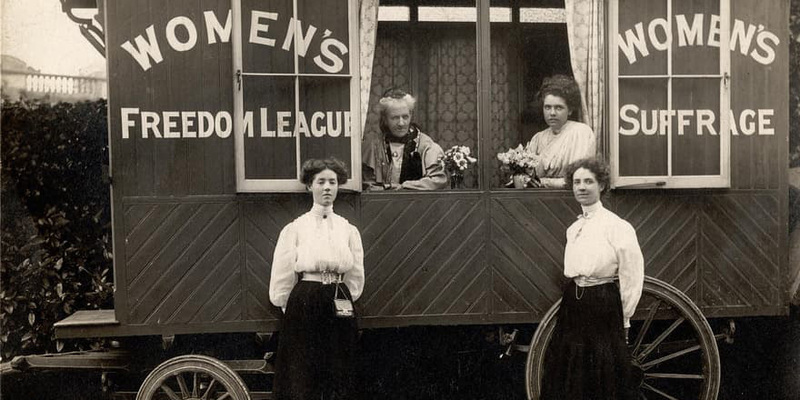 Despard's involvement in the militant suffrage movement dates from 1906, when she joined the Women's Social and Political Union; but in response to Emmeline Pankhurst's stranglehold over the organisation she left it the following year and was among those who founded the Women's Freedom League. She served as its president and steered them along their path of ‘constitutional militancy’, the most notable tactic of which was the non-payment of taxes. She wrote numerous pamphlets on the suffrage question, among them Women in the nation (1909) and Women in the new era (1910), and co-wrote with Mabel Collins Outlawed (1908), in which she drew on her experiences as an inmate of Holloway jail. An active pacifist during the first world war, in 1918 she stood as a Labour candidate for Battersea, and though she failed to take the seat she polled more than 5,600 votes. Throughout this period Despard maintained her contact with Ireland. She regularly spoke at Irish suffrage rallies and during the 1913 lockout was among those, including James Connolly (qv), who addressed a mass meeting in the Royal Albert Hall to raise support for the strikers. Her growing sense of Irishness intensified during the war of independence, when, as a vociferous supporter of Sinn Féin, she was an acute embarrassment to her brother Jack French (qv), viceroy in Ireland. In 1921 she and Maud Gonne MacBride (qv) travelled to Cork and the south-west to collect first-hand evidence of Black and Tan atrocities. Gonne MacBride later recalled her amusement at the ‘puzzled expressions of the officers and of the Black and Tans, who continually held up our car, when Mrs Despard said she was the viceroy's sister’ (Linklater, 218). Having decided later in 1921 to move permanently to Ireland, she immediately entered the political arena. She travelled to Belfast to look into the plight of catholic victims of violence and set up a reception centre for them in Dublin in 1922. After the outbreak of the civil war, she was among the founding members of the Women's Prisoners' Defence League (WPDL); as its president she regularly addressed their weekly rallies in O'Connell Street, where she consistently berated the Free State government for their draconian policies. This period consolidated her friendship with Gonne MacBride. They shared a home at Roebuck House, from where they provided shelter to hard-up republicans and ex-prisoners. It was from here also that she established her ill-fated jam company, which for a time provided work for unemployed republicans and severely drained her private resources. Their chaotic household was subject to regular raids by Free State troops. In 1923 the WPDL was proscribed and Gonne MacBride arrested; Despard maintained a vigil outside Kilmainham jail until her release. By 1926 Despard was increasingly placing her faith in the Irish far left. An executive member of the Irish Workers' Party, founded by Roddy Connolly (qv), she also subsidised their paper the Hammer and Plough. In 1930 she travelled to the Soviet Union for a six-week tour with the Friends of Soviet Russia organisation, of which she was secretary. The party also included Hanna Sheehy Skeffington (qv) and Sheila Dowling (qv). She continued her exertions on behalf of republican prisoners and in 1932 incurred the wrath of the minister for justice, James Fitzgerald-Kenney (qv), who stated that the government would ‘put down women like Mrs Despard and Mrs MacBride and those who are trying to bring in Soviet conditions . . . and if they persist, and if it is necessary, we are going to execute them' (Ward, 217). Soon after she actively campaigned for Éamon de Valera (qv) during the February 1932 general election. Poor health forced her to move out of Roebuck House in 1933, and, after a brief stay at a nursing home run by the sister of her friend Peadar O'Donnell (qv), she purchased a house on Eccles Street, which served as headquarters for the Friends of Soviet Russia and the Workers' College. Later that year the house was sacked by a right-wing catholic mob. Increasingly disillusioned with the political climate in Ireland, she turned her attention to Belfast. Inspired by the strike of 1932, she moved there in 1934, initially living on the Newtownards Road, and later in Glenburn Park. Despite her ill health and deteriorating sight, she kept up her charity work, endowing a local brass band; however, her efforts to promote socialist utopia were frustrated by outbreaks of sectarian violence, and in 1935 she left Belfast for Whitehead, Co. Antrim. This move, which required a bank loan, had disastrous consequences. By this stage she had become increasingly dependent on the care of her employees, but she managed to participate in British anti-fascist rallies (1934) and travelled to France and Belgium for conferences in solidarity with the Spanish republican cause (1936). With her finances in total chaos she was declared bankrupt in 1939. She died 13 November 1939 in hospital after a fall at her home, and was buried in the republican plot in Glasnevin cemetery, Dublin.